Is it the child or adolescent? Is it the family? Or is it the community? face much higher risks than do other children. For example, children are seen as at risk teens if they are disabled, have low self-esteem, or have been abused. The term at risk teens is used frequently to describe children and youth and has a strong intuitive meaning. However, the term has no consistent definition and can be viewed as stigmatizing certain groups. Nevertheless, it is widely used. The positive side of this confusion is that program providers have some leeway in how they define “at risk teen” for their programs. On our authentic, 50,000 acre working Wyoming cattle ranch, your son will begin to understand and appreciate the beauty of the great outdoors and develop a sense of a higher power that will drive positive behavior. 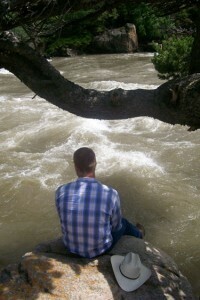 Where some boys who are disruptive often get a “time out,” Triangle Cross Ranch gives them a “time in” – time in the great outdoors, time in reflection and time in communication with God. The staff at our troubled boys ranch is composed of trained mentors, some of whom are former Triangle Cross Ranch residents. During your son’s stay, they will help him understand how to leverage his strengths and recognize his weaknesses. By doing so, your son who is At Risk Teens will develop a greater sense of himself and his relationship to other people, to nature, and to God. Some of this development is through a caring approach by each staff member, and some is through an emphasis on individualized self-discipline that creates a greater sense of self-worth. Unique to Triangle Cross Ranch is the use of ranch duties to help foster self-esteem and learn valuable life occupational skills that will serve your son well as he matures. 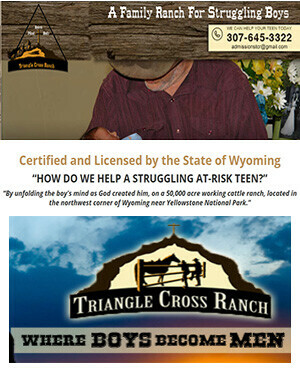 More than just a boot camp for troubled teens, Triangle Cross Ranch is owned and operated by a Catholic family that uses both Christian ideals and the cowboy “Code of the West” to help struggling boys find their footing in an increasingly uncertain world. At Triangle Cross Ranch, your son’s scholastic education is a high priority. Your son will continue to receive his education through one of the academic programs from accredited institutions we have incorporated into our daily regimen. We believe that every boy who comes to Triangle Cross Ranch is intrinsically good and capable of receiving the help to better his lives.